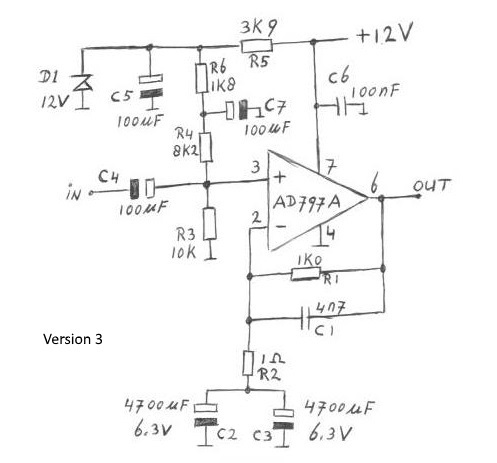 This article is about some noise measurements on the AD797A (datasheet_AD797A.pdf). The AD797A is one of the lowest noise op-amps available. The typical input voltage noise is 0.9 nV/√Hz (and maximum 1.2 nV/√Hz). When the signal source has a low impedance, the input voltage noise must be as low as possible for a low noise amplifier. The input current noise of the op-amp is less important when the source impedance is low. In my test setup, the signal source has an impedance of 0.01 Ω. 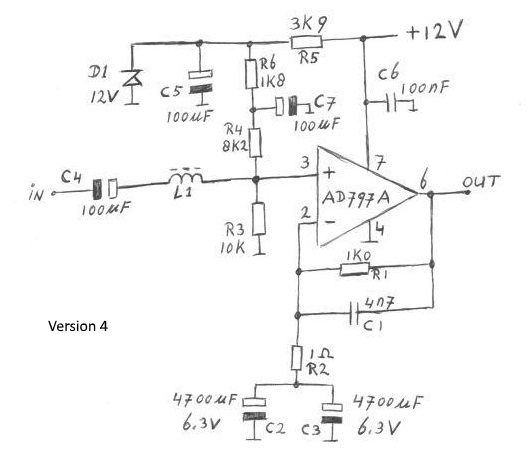 Figure 1, version 1 of my amplifier with the AD797A. The gain is about 1000 times, determined by R1, R2 and the series resistance of C2 and C3. The low -3 dB point is set to about 17 Hz, by the values of R2, C2 and C3. For C2 and C3, I used 4700 μF electrolytic capacitors with a voltage rating of only 6.3 volt. Low voltage types are smaller, and normally have lower series resistance. For protection of C2 and C3 against overvoltage, I added D1, a 10 volt zenerdiode. This limits the voltage across C2 and C3 to maximum 5 volt, even is the supply voltage is increased above 12 volt. Capacitor C5 is there to remove noise coming from the 12 volt supply and / or zenerdiode D1. Input capacitor C4, in combination with R3 and R4, passes all frequencies above 3 Hz. Capacitor C4 is a 10 μF plastic film capacitor. This amplifies is build inside the test setup, and the noise is measured. The signal you see at 1 kHz is a (exactly) -140 dBV test signal at the amplifier input, this is our reference we are going to use. The input noise at other frequencies are in strength compared to this precise -140 dBV test tone. By this, there is no need anymore to know the exact gain of the amplifier under test. The gain of the amplifier is about 60 dB, and in the test setup this is amplified by another 60 dB, so at the spectrum analyser input we get about -20 dBV at 1 kHz. From figure 2, we see the amplifier produces an enormous noise at low frequencies. At 20 Hz, the noise level is 9 dB above the 1 kHz test tone. The total noise level is so high that the test setup is sometimes clipping to it's maximum output voltage of +2 dBV. This causes that we see some harmonics of the 1 kHz signal (for instance at 4 and 6 kHz). Another thing are the harmonics of the 50 Hz mains frequency visible in the spectrum. But one thing at a time, let's first reduce the low frequency noise. At a certain moment, I reduced the supply voltage from 12 to 9 volt, and that reduces the low frequency noise considerably. From this I concluded zenerdiode D1 was causing a lot of noise. When a zenerdiode is reverse conducting, it's impedance is quite low, which makes it hard for capacitor C5 to remove the noise. Especially at low frequencies, the impedance of the capacitor C5 is too high for this job, and noise can reach the op-amp + input. 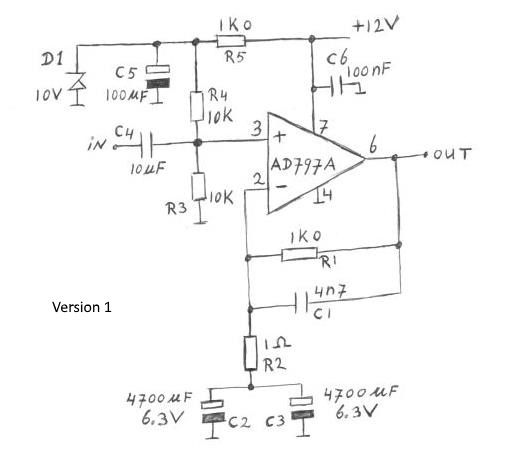 In this version of the amplifier, the zenerdiode circuit is changed. Now a 12 volt zenerdiode is used, which (in this circuit) only comes in conduction when the supply voltage is turned (accidently) above 14 volt. At the normal 12 volt supply voltage, zenerdiode D1 is biased at 10 volt, and is not conducting, and neither is it producing noise. The capacitors C2 and C3 are still protected against overvoltage, they get maximum 6 volt, when the supply voltage is turned up. Above this, an extra noise filter is added in the form of R6, C7. Figure 3, version 2 of the amplifier. Figure 4, noise spectrum of the amplifier versions 2 (compared to the spectrum in figure 2, the dB scale is zoomed in). At 20 Hz, the noise is now 2 dB below the 1 kHz test tone. That is 11 dB less then in version 1. But still there is a lot of low frequency noise left. Then I tried some changes of component values here and there in the amplifier, and found that increasing the value of input capacitor C4 reduces the low frequency noise. In this version 3 of the amplifier, the value of C4 is increased from 10 μF to 100 μF. C4 is now an electrolytic capacitor, the minus pole is via the test setup at a DC voltage of 0 volt. The plus pole is at 5 volt DC. Figure 5, version 3 of the amplifier. Increasing the capacitance of C4 reduces its impedance. At 20 Hz for instance, the impedance is 796 Ω at 10 μF, and 79.6 Ω at 100 μF. Now the + input current noise of the op-amp, and the current noise from R3 and R4 causes a voltage noise across the impedance of C4. And the lower the impedance of C4, the lower this noise will be. Figure 6, the noise spectrum of version 3 of the amplifier. The noise at 20 Hz is reduced by 18 dB in respect of version 2 of the amplifier. In the AD797A datasheet, we find that the input noise voltage increases at low frequency. 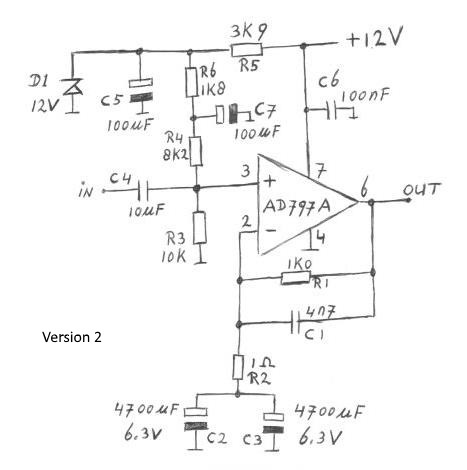 Figure 7, The input noise of the AD797A (picture taken from datasheet). At 10 Hz, the noise voltage seems to increase to 1.8 nV/√Hz, which is 6 dB extra noise compared to 1 kHz. In my amplifier version 3, there is more then 6 dB extra noise at 10 Hz. This is caused by the input current noise, which increases also at lower frequency, and build up a noise voltage across input capacitor C4, which impedance also increases at lower frequency. Maybe I should increase capacitor C4 even more, but for the moment the low frequency noise is good enough for me. What we still have, are the 50Hz interference, and its harmonics. I found out that this mainly comes from the magnetic field from the power supply I use. For the spectrum of figure 6, the power supply was 80 cm away from the amplifier. When the power supply is placed further away, the interference reduces. The power supply has an EI core transformer inside, of about 150 VA. Figure 8, again the noise spectrum of amplifier version 3, now the power supply is places 2 metre from the amplifier. Interference from the mains frequency is now almost gone, but when the amplifier is rotated in certain positions, there is however some increase in 50 Hz interference. When a device with toroidal transformer is places nearby the amplifier, there is much less 50 Hz interference then with the EI core transformer. Toroidal transformers have a very low external magnetic field. Probably the picking up of magnetic field can be reduced by building the amplifier more compact then I did for this test circuit. The aluminium enclosure I use works good for screening electric fields, but it does not screen the magnetic field. 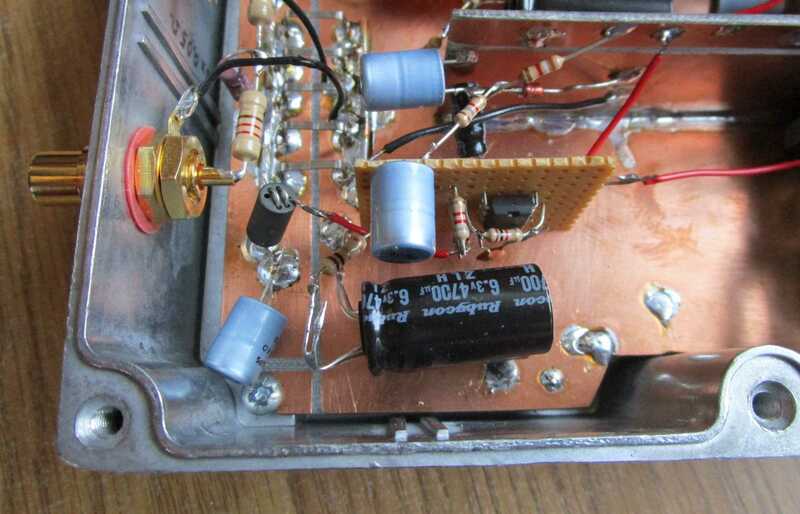 One last improvement in the amplifier is a small coil (L1) in series with the input. L1 is a 6 hole ferrite bead, with 2.5 turns on it. Probably in the measurements above, the amplifier was oscillating on some high frequency, which was at audio frequencies only noticeable from a small increase in noise level. The addition of L1 reduces the noise floor by about 2 dB. Figure 9, version 4 of the amplifier. This amplifier design is only intended for noise measurement purposes. For use as a practical amplifier, it is less suitable. For instance, when you power it up, it takes about 10 seconds before C2 and C3 charge up (via R1). During this time, the op-amp output first clips to the supply voltage, and then oscillates for some seconds. Another thing is that the input is almost not current limited by resistors (which produce noise), only by R1, which is only 1 Ohm. An input voltage more then 0.7 volt from a low impedance source, could produce enough current (more then 25 mA) through the input protection diodes inside the AD797A, to blow up the input. In my test setup this is prevented by only using very low input signals, at 0 volt DC. Figure 10, the AD797A amplifier version 4, build inside the test setup. Figure 11, noise spectrum of the amplifier version 4. From figure 11, we see the noise floor at 1 kHz is 32.3 dB below the 1 kHz test tone. The 1 kHz tone is exact -140 dBV at the amplifier input. So the 1 kHz noise floor is at -172.3 dBV, this is measured by the spectrum analyser in a bandwidth of 8.79 Hz. To go to 1 Hz bandwidth, we need to subtract 9.44 dB, and get -181.74 dBV in 1 Hz. The measured input noise voltage of the amplifier is: 10^(-181.74/20) = 0.82 nV/√Hz. 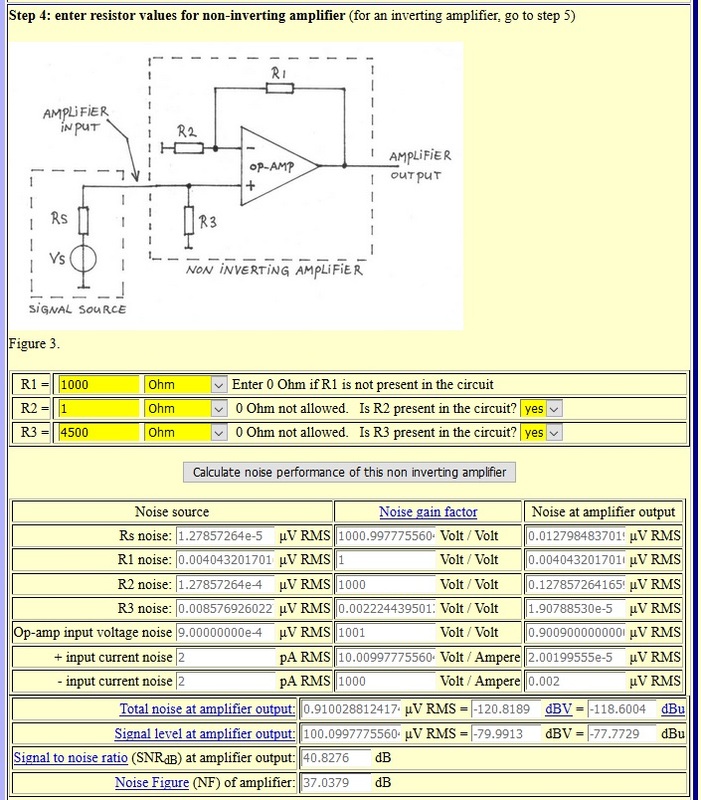 With the op-amp noise calculator we can calculate the theoretical noise production of the amplifier. let's see how that is, compared to the measured value. 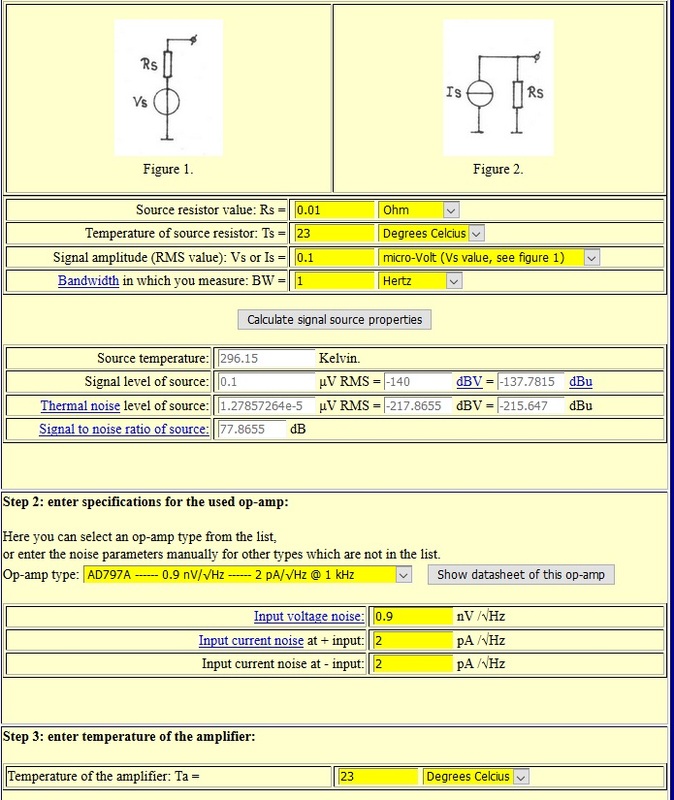 Figure 12, specification of the source and op-amp in the calculator. Figure 13, specification of the resistor values. The entered value of 4500 Ω, is in the amplifier the parallel value of R3 (10 kΩ) and R4 (8.2 kΩ). In the results, we see the "total noise at amplifier output" at: 0.91 μV in 1 Hz bandwidth. Divide this by the gain af the amplifier (1000), and we get 0.91 nV/√Hz at the input. This is only slightly more then the 0.9 nV/√Hz input voltage noise of the AD797A. Via the measurement we found: 0.82 nV/√Hz. This is 1.11 times, or 0.9 dB less then calculated value of 0.91nV/√Hz. For the output amplifier of the test setup we already found that the measured noise was 0.76 dB lower then the theoretical calculated value, so about the same situation there. Maybe this difference is caused by the average process in the spectrum analyser. Let me explain this with a very simple example. Let's say, one sample is 1 volt (0 dBV). The other sample is 2 volt (+6 dBV). When you look at the voltages, then the average is 1.5 volt which is 3.52 dBV. But when you average the dB values, you get +3 dBV, so lower in value. In my measurements I use the average of 200 measurements, to remove noise from the dB reading. Without the average process, it is not possible to read the dB value accurately because of all the noise you see. Another possible cause of difference between calculated and measured value is the amplitude response within a frequency bin. Figure 14, amplitude response within one bin, measured with the Hanning window function. The bin's are 5.859375 Hz wide (to be precise), in this diagram bin number 170 is shown (about 996-1002 Hz). All the bin's in the whole spectrum have the same amplitude response as the one shown in figure 14. The measured amplitude of a discrete tone is the highest near the edge of the bin. In the centre of the bin the measured amplitude is the lowest. This gives a problem when you want to calibrate the spectrum analyser dB scale to a (exact) 1.00 V test tone, because it depends where in the bin the exact frequency of the test tone is. Maybe the response in figure 14 must be shifted 0.7 dB upwards, to bring the average response at 0 dB, but actually I don's know this. What I will do, is introduce a correction factor, to compensate the inaccuracies I measure. To bring the measured value more in accordance with the theoretical value, I will from now on add a correction factor of 0.9 dB to the measured value. In figure 11, we see the 1 kHz, -140 dBV signal clearly standing above the noise floor. In this sound file: AD797A_version4_1000Hz_-140dBV.mp3 you can listen to this signal, amplified by the AD797A version 4 amplifier. But keep in mind that you will hear the sum of all the noise across the whole spectrum, so that is a lot of noise in your ears. However you can hear the 1 kHz tone without much problem through the noise. The first 10 seconds the 1 kHz tone is on, the last 5 seconds it is switched off. My CD player only gives an average of -3 dBV at the output, so after the 140 dB attenuator in the test setup, we have -143 dBV (0.07 μV) music signal at the input of the amplifier. Here you can hear 0.07 μV music in a see of noise : AD797A_version4_music_-143dBV.mp3 . In the next part of this series, we will test some amplifiers with discrete transistors, and try to reduce the amplifier noise.